Home Again: Spare Limbs Anyone? If any of you watched Larry King on Tuesday, Jan.25th, you will have noticed his alarming news of patients with amputations and missing limbs due to being crushed in the earthqake. Larry King invited guest Heather Mills, who also lost a limb in a car accident in 1993. She is a charity activist, with United Nations good will ambassador. She is working with Physicians for Peace and she is urging people to donate their old prosthetic, crutches and wheelchairs to the people of Haiti. She also talked about about the medical and mental support needed by the amputees during the coming weeks and years. Imagine 200,000 people having lost limbs. How can one ever bring them back into the work world? Follow up care is important. As I sifted through my photos this past week, I was once again reminded and totally amazed to see how my own children have learned to cope and adjust to their father's limitations. He loves to swim, ski, and cycle as his recreational activities. I found this photo...and could not help but share this information with you. It seems so appropriate at this time. 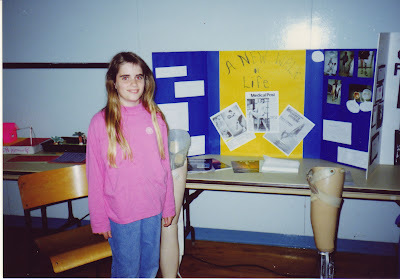 On one of Suzanne's science projects in Grade 6 she chose the theme...."A New Walk in Life" and demonstrated the use of prosthetic limbs to the students in her class. She showed them how they functioned and how one could continue to make a difference in life regarding physical limitations. Would you believe that twenty years later, she, now being a school teacher has her father come annually to her class, bringing along his limbs, showing the students how the limbs function and then she has the students interview him. This is a hands on object lesson for all the students. This is something most of them never forget. Guess what John is doing the first week of February? Once again, off to her class, bringing the awareness of living life with limitations. If he can do it, I'm sure that by our continued support to Haiti, we can give life support to many other people who have lost limbs by amputation during the recent earthquake. Did you notice one thing? She is wearing pink....that's a first. A few weeks ago, John had to go into the city to have some adjustments made on his limb. One of the technicians showed us her limb. I could not believe that she could actually wear heals. Is that a French manicure? Yes, in the summer she runs around in her sandals. Can you distinguish which is the real foot? They have come along way in designing and creating prosthetics to take on the real image of one's particular skin tones and foot measurements. My other daughter is working as an Occupational Therapist. I remember way back when she was small....She said, "I want to help people like my dad, learn to walk." And that is exactly what she is doing. She loves her work and helps patients find new ways to develop new dreams. I'm fascinated by watching and reading stories of the paralympic athletes. They have achieved remarkable results in their sports and private lives. There are over 1,350 athletes participating in the Paralympic Winter Games. I'm sure that as we watch the paralympics we will become aware of many limitations, and yet the hope of each one to dream and reach their goals becomes so evident. Wow, Marg! this needs to be published in more places than just here. 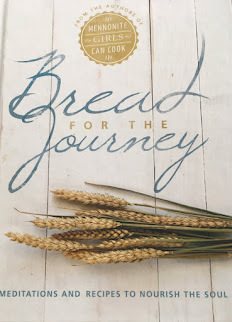 It's so informative, encouraging and challenging. Thank you. Thank you. My little babushka lost her hand and arm up to her elbow in Russia when she was young. She raised 2 kids, changing diapers, etc. She embroidered beautifully. She did more with one hand then most people do with 2! Marg that is so cool! The modern technological advances are amazing, and yet I have also read of amputees in India having simple molded rubber feet made with which they are even able to climb trees. Any thing is better than nothing, but more is better of course. I wonder if the prosetic artists add veins and calluses to older amputee limbs. It would be pretty dismaying to have to look at one perfect "fake" foot, and one aging "real" foot. Ohhhh....vanity...does it ever stop? Just this morning we were talking about this. I mentioned Marg is smelling for snow to go skiing. . and then we talked about J and whether he skiis too .. how fantastic. I have often thought in the last little while how blessed we are to have our medical system here in Canada. It may not be perfect. . .but we have many blessings through it. 'Champions are made by the things you accomplish and the way you use your abilities in everyday life situations.' Well said! Your J is an everyday champion. Hope you guys are having a wonderful time skiing...something I can't even do with two perfectly fine legs. Thanks for the reminder. The people in Haiti will need so much support. 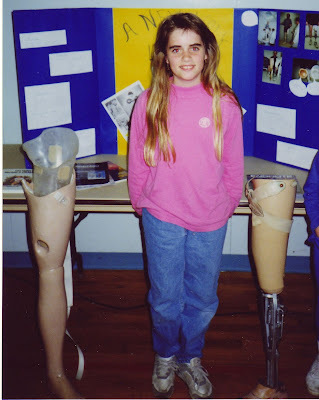 I grew up with a girl who was born with only one leg and she kept up with everyone. Science is amazing. I would love to drop in your daughter's class and catch the presentation. Hi Marg! I agree with Annaliese... I hope people searching on the net for information on these will come to your post... sometimes that happens to me ... I find my answers in blogs! I can't get over how realistic her limb looks! What hope there is! 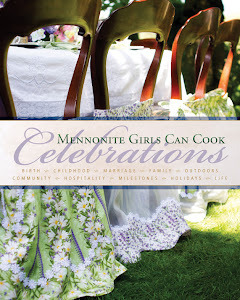 This is so well written ~ you have really opened our eyes to all that is new! Beautiful post. Thank you for making me more aware of this. I'm so thankful for the technology and the people who study these things. Truly, they have changed lives. I admire people like your husband who with courage and determination meet challenges that seem to us to be unsurmountable. 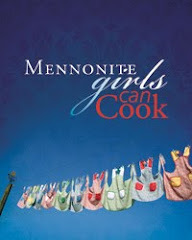 They not only meet those challenges but surpass every expectation. My Cousin's son in Ont. is studying to be a "Prosethitist" (is that what it's called?) It is such a worthwhile pursuit and brings hope and activity to those who would otherwise not have it. They spoke this morning on CBC about a clinic called "Helping Hands" in Haiti who provide prosthetic care. How their clinic was destroyed in the earthquake and what life will be like for those thousands of Haitians who have lost limbs. So, so difiicult in a country where nothing is mechanized, walking is how you get around and everything is done by hand. Thank you for sharing your family's journey.